Market is formed by [Gold Market] and [Silver Market]. 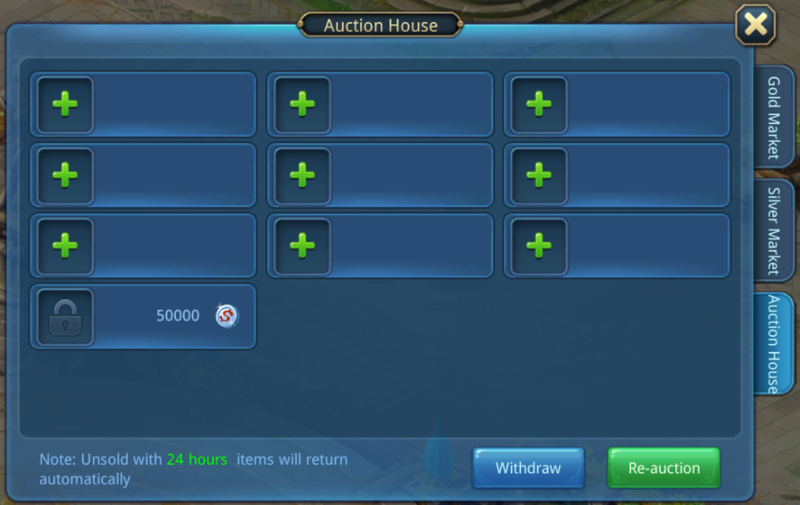 [Gold Market] Players can buy Divine Equipment, Pet Skills Scroll, Formation, Wings Materials and other major items. 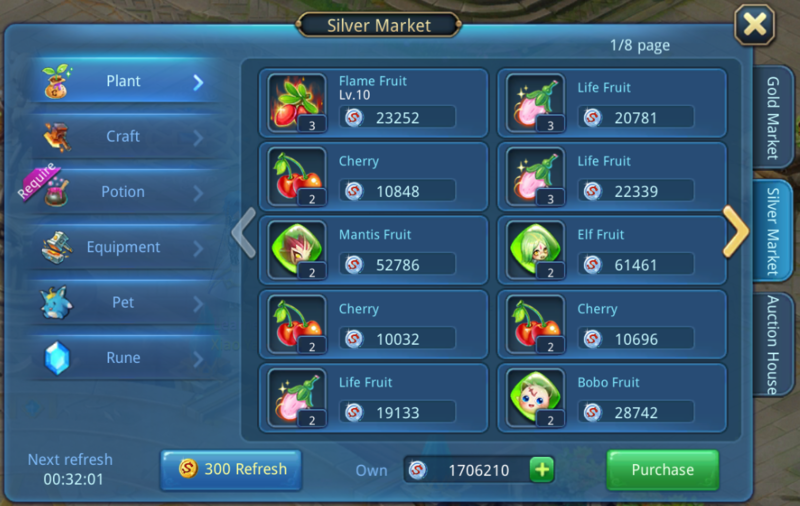 [Silver Market] Players can display items to sell or buy fruits, medicine/herb, Equipment Materials, rune, and etc. I. 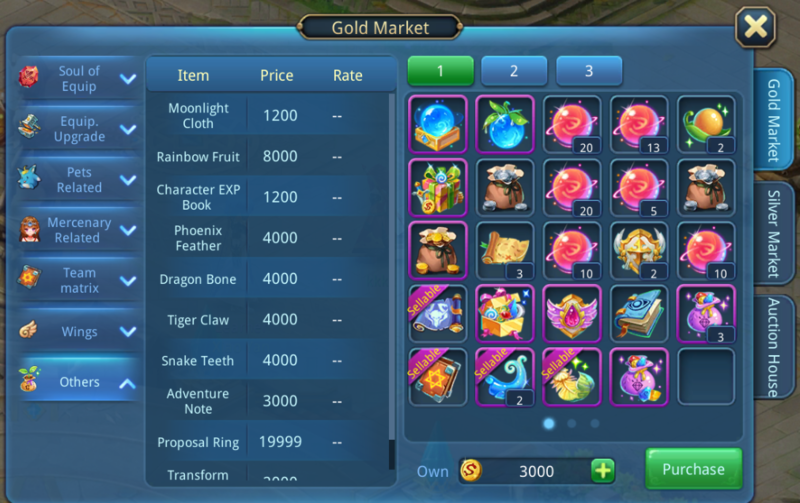 [Market Page]Tap the Market Page, and choose the first page tag “Gold Market”. II. [Choosing Type] Click the list on the left, choose the items type to buy. III. [Items Purchasing] Click the items that want, and click the “buy” on the lower right corner. IV. [Selling Items] On the right side of bag interface, click “can sell” items to sell items. V. [Price Fluctuation] The price of items in Gold Market will happen fluctuating depends on the purchasing and selling. VI. [Fluctuate explanation] When players purchase numerous of goods, will cause the price of certain goods increase, whereas if the players sell great amount of goods, the price of certain goods will decrease. Silver Market is a platform for players to trade with others. Rune, fruits, medicine/herb, craft talisman, sewing talisman that produced by life skills can be stall to sell or purchase. I. [Market Page] Click the Market Page, and choose the second page tag “Silver Market”. IV. [Fixed Price of Items] The price of Silver Market Items major decided by the seller, buyer can turn page to look for cheaper items. V. [Refresh Time] Every 2 minutes can refresh Silver Market a time, during cooling time, have to spend 300 Gold to refresh. I. [Selling Page] Click the Market Page, and choose the third page tag “Selling Items”. II. [Items to sell on shelf] Click the blank space to open “Items Selling” page, choose items and set the price to sell on shelf. III. [Bulk add to shelf] Choose numerous items and setting price, then click “Put on shelf” to display. V. [One-click Withdraw] If the items of shelf have been sold, tap one-click withdraw to get the coins. VI. [Timeout Remove] Those items haven’t been sold in 24 hours, will be removed from the shelf. VII. [On shelf again] Those Timeout Remove items can tap “On shelf again” to sell, we suggest the player put reasonable price to sell the items on time.